The Heineken Cup heads in to a make-or-break double header this weekend, with Europe's biggest clubs preparing for back-to-back showdowns that will help to define this season. 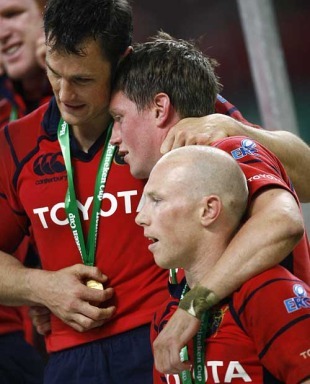 Perpignan travel to one of the tournament's hallowed grounds, Thomond Park, and are sweating over the accurate boot of Ronan O'Gara - the Heineken Cup's all-time leading scorer. With this in mind, we take a look back at the figures who have shaped the tournament in our latest Scrum Seven. The Munster fly-half has endured his fair share of close-calls both in the green of Ireland and the red of the British & Irish Lions, but in the colours of Munster he has been a colossus. The only man to break the 1,000-point barrier in the tournament, O'Gara's kicking underpinned Munster's triumphs in the 2006 and 2008 editions. By the time he got his hands on the trophy after kicking 13 points in the 2006 final win over Biarritz in Cardiff he had already fallen at the final hurdle twice. The victory was a cathartic moment for the fly-half, who, along with Anthony 'Axel' Foley and Paul O'Connell, had become a beacon for the side in the Heineken Cup. A one-club man, Clerc inscribed his name at the top of the Heineken Cup scoring charts with a brace against Sale Sharks in the opening round of the 2009-10 tournament. Diminutive in stature but deceptively strong, Clerc has been the mainstay of a Toulouse side who have dominated the Heineken Cup landscape. He possesses two winners' medals, secured in 2003 and 2005. During the all-French 2003 final at Lansdowne Road, Clerc scored his side's only try as they defeated Perpignan 22-17. Welsh wing Dafydd James has scored Heineken Cup tries for more sides than anyone else. The record try-scorer until Clerc's ascension in to the position, his exploits span the regionalisation of Welsh rugby and also take in a spell with England at Harlequins. James scored a memorable try to help the Scarlets defeat reigning champions Munster at Stradey Park to book their place in the 2006-07 semi-finals, latching on to a kick through by Dwayne Peel, but his record 29th try came in unhappy circumstances as the Scarlets were dismantled by Clermont Auvergne the following season. The 1999 Heineken Cup was a fairytale for Ulster and their skipper David Humphreys. Naysayers will point to the English clubs' refusal to play due to a dispute with tournament chiefs but the achievement of Humphreys' men cannot be underestimated. Ulster beat Toulouse home and away in the group stages, before sending Stade Francais packing in the knockout stages. Colomiers stood in their way in the final, where the boot of fullback Simon Mason was the key. Humphreys led his side with consummate professionalism; his intelligence as a fly-half matched by his commitment to the cause. He also won them the Magners League title with a 40-yard drop-goal in 2006. The 2005 Heineken Cup final scoreboard should have read Leicester Tigers 34-30 Diego Dominguez. The diminutive fly-half set a new points-scoring record for a final with his tally of nine penalties and a drop-goal, but was on the losing end. A consistent and excellent performer for Italy, and for two caps Argentina, Dominguez showed on club rugby's biggest stage that he was one of the best in the business. He struck a blow for Italian rugby in the process and opened the doors to the likes of Sergio Parisse and the Bergamasco brothers. A true heavyweight of the French game, Pelous was the granite at the centre of the Toulouse side that played some of the most scintillating rugby seen in the Heineken Cup. In 2003 he lifted the Cup for the first time after victory over Perpignan, before ascending to the French captaincy as well as leading his hometown club. After disappointment in 2004 he led Toulouse to a record-breaking third European title against their perennial rivals Stade Francais the following season. No side has matched the record as of yet, and Pelous sits fourth on the all-time appearance list, the only French player in the top 10. As a number of players on this list demonstrate, the best don't always get to the top. It was beginning to look that way for Leinster's talismanic centre Brian O'Driscoll until 2009, when he added the Heineken Cup title to his long-awaited Grand Slam in the colours of Ireland. Images of him lifting the trophy after his side's victory over Leicester at Murrayfield will have brought a smile even to neutrals, who can always think back to his miraculous try against Toulouse in 2006 as the men in blue pulled off a remarkable upset in France.